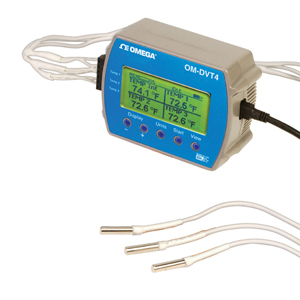 The 4 Channel Data Logger temperature OM-DVT4 with display is an easy-touse, versatile device which can be used for a wide range of logging applications. The OM-DVT4 records and instantly displays trends for up to 4 temperatures using one internal and three external sensors. The large, clear display shows all channels simultaneously, as well as the temperature difference between channels. When you’re ready, download up to 87,000 data points to your PC for further analysis. Nota: Comes complete with operator’s manual and Windows software on CD ROM, 3 “AA” batteries, set of 3 external temperature probes and 1.8 m (6 ft) USB interface cable.